It is hard to pick up the subtleties of damascus steel with my meager photography skills, so you’ll all have to wait a little while for really good pictures. First the prototype goes to GRRM for his review, then it can go to the better photographer. 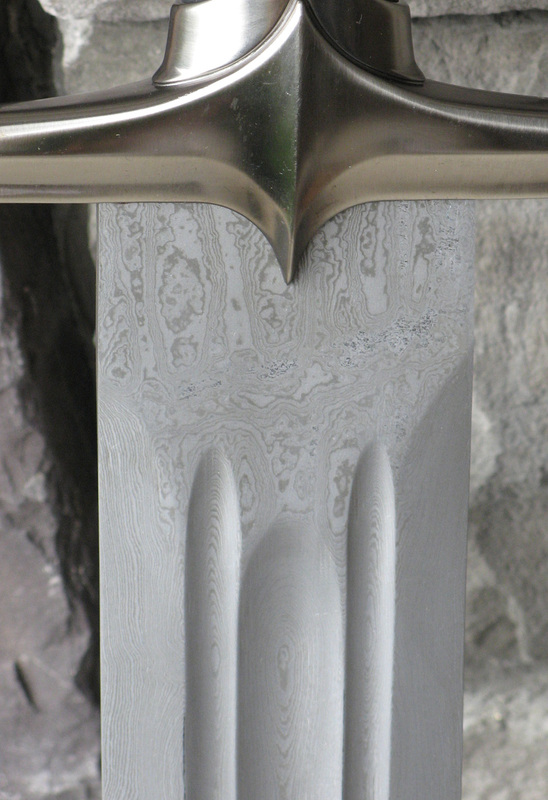 This is a 1060 high carbon damascus steel blade. 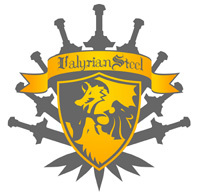 Truly what GRRM had in mind when he first wrote about Valyrian Steel. It is, pretty, and strong, and expensive. This sword will probably be a limited edition of 100 pcs. It will probably be for around $500. In addition to having the damascus blade, we’ll see about doing the eyes in actual genuine garnets as well. If you want one, please, by all means, comment on this post. If 150 people say they want one, we might be be convinced to increase the edition size. Even look at it as an investment, once the HBO series comes out they’ll probably appreciate. We’ll also be strictly shipping based on order date, because it is a smaller run, it will be no problem to manually make sure he who orders first gets the lowest number. Though we may run an auction for #1, and then have the first order go for #2. Anyways, I think we could see this blade being released in very early 2010, but we’ll have to wait a couple more weeks to finish finalizing details. Needle update: Got the final prototype today, just reconfirming the length, sword should ship within 2 months. Ice update: The (hopefully) final concept art is on GRRM’s desk right now. It looks great, I can’t wait to show you. If you live in a country where we previously quoted a shipping cost of over $100 for Longclaw, you may be in luck. We’ve had some success breaking the rules and shipping this 56inch box to countries that supposedly have a 42 inch length limit. We’re willing to try, with the caveat that if the shipment is rejected and we cannot get a refund of the shipping cost, we cannot reimburse you for that cost, we will of course still refund whatever you paid for the actual product. So, that being said, to do this you must pay with a check or money order, because it is special. You can also pay with Western Union, email us for details. So checkout and select “Print Order Form” as your payment method, then print it and mail it with a check. Using this shipping method Longclaw will only cost $90 to ship to Australia (down from $350). Other countries, please comment here and I will get you a quote.